Please note: It is the installer's responsibility to verify correct fitment for your wheels. Visually verify before installation and contact us or the wheel manufacturer to verify proper fitment. Keep your Tundra genuine Toyota with these factory Toyota Tundra wheel locks for the proper fit, look and protection for a minimal cost compared to the loss of your wheels and tires. The visual transition will be subtle but the benefit of knowing your wheels are secure will not when you get these factory Toyota Tundra wheel locks for the best protection. You get a matching key used for easy mounting and removal with your Toyota Tundra locking lug nuts in this handy wheel lock kit to protect your wheels and tires. 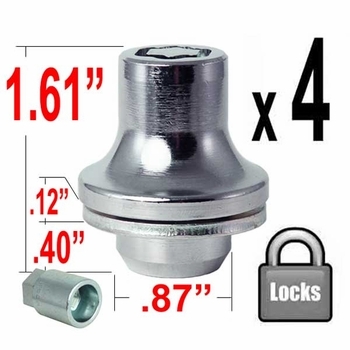 Rest assured that your Toyota Tundra locking lug nuts are made from hardened steel so they are built to last for years to come as well as the protection for your factory wheels.